Back around 2010, I had been introduced to the Chicago-based band Man Called Noon. At that time, I became familiar with the band because of their album Broke and Beaten Down. With that release, the band created an album that alternated between solid Rock and Roll and a style that was more folk-infused. While the tracks were interesting with the continuous alternating of styles, the album seemed as if it was missing some sort of glue to hold it together. 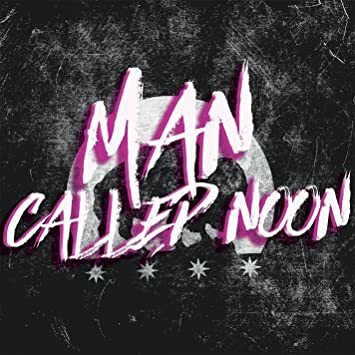 Several years after reviewing 2009’s Broke and Beaten Down, and after having released another album in the meantime entitled Edge of the Night, Man Called Noon returns with their newest album entitled The Bad Guy. With this album, the band creates a slightly different style of music than what had come before. That has to do with the new lineup for the band. Having gone through some changes over the years, Man Called Noon now consists of Lead singer and rhythm guitarist Tony Giamichael, bassist Dave Aitken and Drummer Josh Fontenot, as well as new band members Elisa Carlson (Keys & Vocals), Stephanie Aitken and Erin Piotrowski (Backing Vocals), and new lead guitar player Alex Ross. This new lineup incorporates some of the old sound and feel of the band while also taking the band’s sound in a new and more interesting direction. The new sound of Man Called Noon can be found on The Bad Guy, the 2015 release from the band. The Bad Guy begins with the title track to the release. “The Bad Guy” finds Man Called Noon creating some good, old-fashioned Rock and Roll. The track starts will a strong combination of bassist Dave Aitken and Drummer Josh Fontenot as they create a strong beat. Eventually, the rest of the band joins them. The solid Rock and Roll style featuring guitars and some piano on the track would easily be right at home with anything that would have been found on Rock and Roll formats back in the 80s. “The Bad Guy” could fit between tracks from Bruce Springsteen and Rick Springfield. The track’s sound is fresh enough that it would also be welcome on today’s Top 40 formats. The new release from Man Called Noon continues with the song “Dark Side of the Dawn”. Like the title track before it, “Dark Side of the Dawn” has a very strong retro feel to it. And just like “The Bad Guy,” “Dark Side of the Dawn” sounds like something from the 80s. The inclusion of both the piano and the keyboard on the track definitely gives the song a very commercial musical approach. The commercial feel of the music and the driving feel to the tempo of the song make the track very an easy single off the release. Man Called Noon takes the sound of their music in a much more “pop-like” direction with the next track. “Dance Tonight” features a strong bass/drum approach with just enough guitars and keys being added to the mix to flavor the song. The various musical elements combine together to create a strong dance beat and that makes the song one of the strongest tracks on the album. With the track “More,” Man Called Noon drastically changes the musical direction of their music. While the previous tracks stayed in a pop/rock vein, “More” finds the band heading in a much more Alternative Rock direction. The harder sound of the guitars, the stronger beat of the drums and the slower tempo all combine to create a track unlike anything else on the release up to that point. The change of pace is good and keeps the album interesting. The band switches their sound once again for the track “Hold On”. The piano-driven track finds the band returning to something that would belong in the eighties. The rockin’ track seems to be a combination of the energetic driving rock and roll of someone like The Fools with a little bit of keyboard-pop thrown in. “Hold On” is easily one of the best tracks on The Bad Guy from Man Called Noon. Appearing late in the album is one of the strongest, most listener-friendly tracks on the 9-track album. “Midnight Revival (Get Down)” is a track that features a very addictive melody, a strong beat and easy lyrics that lend themselves to a very catchy sing-along. While the song may not be something that FM radio might pick up on, “Midnight Revival (Get Down)” has a sound and style that would be perfect for use in commercials or in a movie soundtrack, which is just as good as being played on the radio. While I was already familiar with Man Called Noon, the band’s new album was a nice surprise. The new release from Man Called Noon finds the band creating a much stronger vibe than what had appeared on the band’s 2010 album of Broke and Beaten Down. The Bad Guy contains better musicianship, stronger songs and an all-around better sound. If unfamiliar with Man Called Noon, The Bad Guy is the perfect place to discover the band for yourself. To discover the music of Man Called Noon, click the link for the track “The Bad Guy“. To purchase a copy of The Bad Guy from Man Called Noon, click the link.